KOKOMO, Ind. — Indiana University Kokomo student nurses Mandie Henchon and Susanna Munsell think they are just doing a simple vitals check on Janie Woods, a patient recovering from knee surgery. Their visit turns out to be anything but routine, as their patient insists on more pain medication, throws up on them, and even requests wine with her lunch. Nursing students practice on a manikin in the IU Kokomo St. Joseph Hospital Clinical Simulation Center.Behind a nearly window, Stephanie Pratt, interim director of the IU Kokomo St. Joseph Hospital Clinical Simulation Center watches to see how they react during this simulation exercise, which is part of the School of Nursing's curriculum. Pratt said the center allows nursing faculty "to give our students the kids of challenges they will face in the field, but in a controlled environment. It is more effective to learn by doing, rather than just reading or taking notes in class. This is increasing the quality of education we provide." Pratt manipulates the mannequin from the control room, providing Woods' voice, and watches to see how long it takes the students to pick up on her underlying psychiatric needs. "Could I have a glass of wine with my lunch?" Woods asks, visibly startling one of the students, who tells her very politely that will not be possible. "We're not trying to upset you, but it's policy we can't serve wine in the hospital," Henchon explains, as she continues to take the patient's vital signs. Woods asks several more times, in an increasingly impatient voice, stating she has a glass, or a few glasses, with every meal. Finally, Munsell asks if her doctor knows she drinks, and notices the Woods is sweating and shaking. "What could be happening is, you could be having some withdrawals," Munsell said. Pratt smiles, happy the students, who were expecting a medical surgical situation, realized their patient had more medical needs than they expected. "As a nurse, you can't just go in to a patient's room with a plan in mind," she said. "You always have to expect the unexpected, and be ready to react. Some students do really well in class, but struggle with the hands-on aspects, and that is an important part of their education. That's what nursing is, it is hands-on." Linda Wallace, dean of the School of Nursing, said the simulation center "helped us take a huge step forward in educating the future nurses of north central Indiana. When they step into the role of a real nurse, we have closed a gap and given them an experience that will help them practice and build their skills, so they graduate ready to provide excellent care." 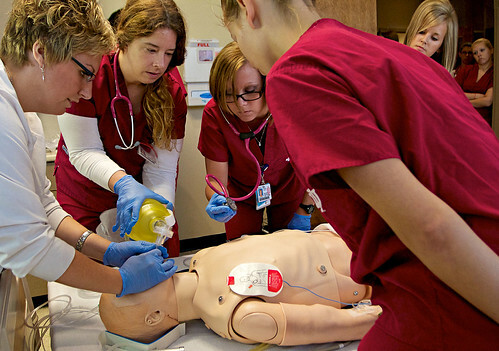 Students each participate in clinical simulations three to five times per semester, and Pratt said it is used nearly every day. The 3,250-square foot lab includes four hospital suites, two control rooms, a nursing station, and two classrooms. Wallace said it allows students to practice in situations they would only be able to watch in an actual hospital. "We can challenge them a little more here," she said. "They can't give medications in their hospital clinical experiences, but here, they can practice with replicas of real medication, to learn the proper procedure. They can practice what to do if a patient is bleeding out, or if he or she stops breathing, without it being a life-or-death situation." The simulations mimic the sights, sounds, and events in a real hospital, including having people play the part of overanxious family members, or caring for patients in multiple rooms at the same time, so they learn to deal with those situations while providing excellent patient care. They also gain confidence in their ability to handle emergencies. Ashley Cottingham and Jessie Cunningham, students in Pratt's medical/surgical nursing class, learn what can go wrong while treating "Catherine Doyle," a patient who just had hip surgery. Pratt watches from the control room as the two begin taking their patient's vital signs. They note she has a fever, and she is complaining of pain. Pratt waits to see how long it takes them to check the surgical incision, to look for infection. She notes, however, this is their first time in the center. "These first simulations are always the hardest," she said. "They're doing well for the level they're at this semester. They'll get more confident and have more knowledge to apply later." The students struggle with the electronic charting system, to see what kind of medication they can give her for the pain, before calling the doctor, portrayed by Sylvia Jones, a visiting observer from IU Health. Jones asks what the wound looks like, and neither can answer, so they take a look, only to find what Cottingham calls "gooey, stinky seepage." Pratt notes this is one of their "low tech" tricks, because she has used butterscotch pudding under the patient's dressing to mimic what infection would look like. Jones orders a blood culture and medication, which the students give in an IV drip. They also work on their bedside manner, reassuring Doyle, who has grown anxious. "Am I going to lose my leg?" she asks, sounding near tears. "We're going to work on getting this infection cleared up for you," Cunningham says. After they're done, Pratt meets with the students in a debriefing session, talking about what they did well, and what they might do the next time to provide better care. "I think this is easier with real patients," Cunningham said. Cottingham said after this experience, she would not forget to look at the wound before calling the doctor. She said now that she's had one experience in the lab, she would be less nervous next time. "The next time, I'll be more confident and know what to do," she said. "It's nice that we have get some experience practicing where if we make a mistake, we're not making it on a real person." The $1 million lab opened in August 2011, funded by a gift from St. Joseph Hospital and St. Vincent Health.